Oxford - the 'city of dreaming spires' - famed for its University and architecture such as the picturesque Radcliffe Camera, Bridge of Sighs and Bodleian Library, as well as numerous museums, parks and open spaces (plus 'punt' boat rides along the River Cherwell) charm and entice visitors from around the world. With Celtic Horizons you can experience the majesty of Oxford (and nearby Blenheim Palace) either on a guided tour or as a stop on an airport transfer tour between a London airport and your Bath or West of England destination. 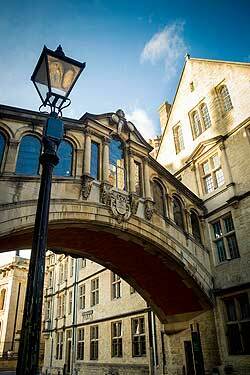 Oxford can be visited either on an airport transfer tour (when travelling to or from your Bath or West of England destination and a London airport), on one of Celtic Horizon's suggested tour routes or build it in to a custom tour around your own requirements - contact us for details and prices.